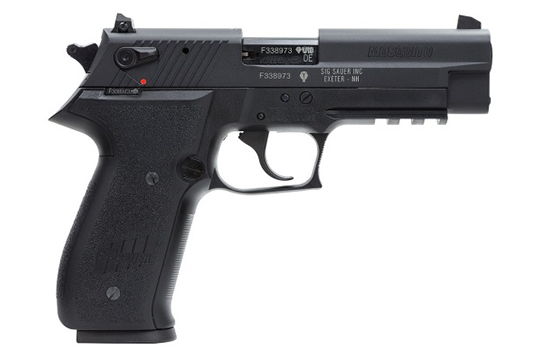 People who get a kick out of plinking and other kinds of target shooting have discovered the perfect companion: the Sig Sauer Mosquito pistol. + Informal Recreation Shooting Backyard clays, tin cans, spinning/swinging targets, water jugs, etc. + Metallic Silhouette Metallic silhouette involves shooting at steel targets representing game animals at varying distances, seeking to knock the metal target over. + Bullseye Bullseye, also known as precision pistol, is a shooting sport in which participants shoot handguns at paper targets at fixed distances and time limits. + Home House, apartment, condo, camper, cottage, cabin, etc. + Vehicle Automobile, motorcycle, truck, boat, ATV, etc. + Informal Recreation Shooting Plinking, backyard clays, tin cans, spinning/swinging targets, water jugs, etc. + Bullseye Bullseye, also known as precision pistol, is a shooting sport in which participants shoot handguns at paper targets at fixed distances and time limits. + Metallic Silhouette Metallic silhouette involves shooting at steel targets representing game animals at varying distances, seeking to knock the metal target over.